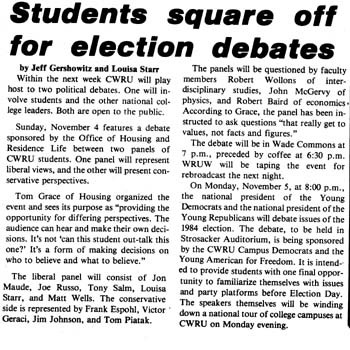 At least three debates were held on campus. Cuyahoga County Republican Party Chairman Bob Hughes debated Cuyahoga County Commissioner, Democrat, Tim Hagan. A liberal student panel faced a conservative student panel. National Young Democrats president debated national Young Republicans president. A poll conducted by the Political Awareness Club correctly predicted a Reagan victory. A two-panel debate and two-person debate were held on campus. 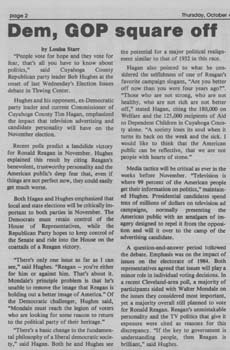 Cuyahoga County Republican leader Bob Hughes and Democratic County Commissioner Tim Hagan faced off in a debate. Information was compiled by staff of the Case Western Reserve University Archives, September 2004.